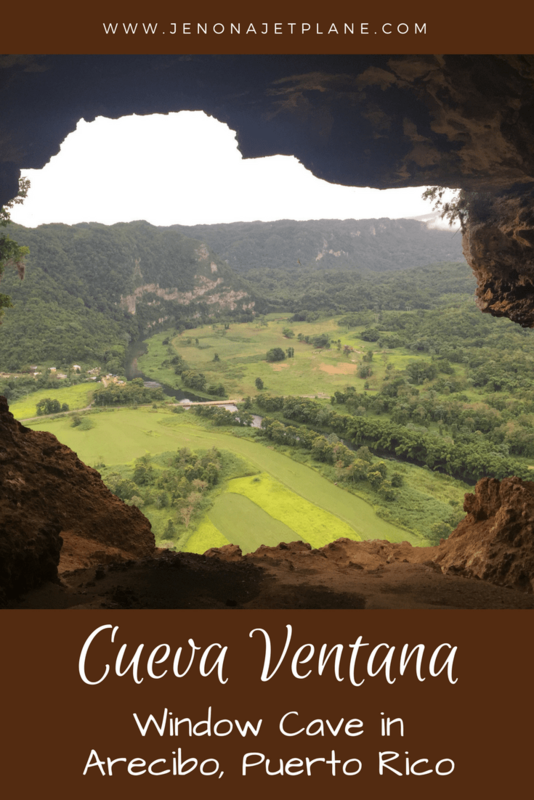 Looking to visit Cueva Ventana in Puerto Rico? You made a good choice. Cueva Ventana is one of over 2,000 caves in Puerto Rico, and easily a contender for the most impressive one. Surprisingly, many caves on the island are still undiscovered. 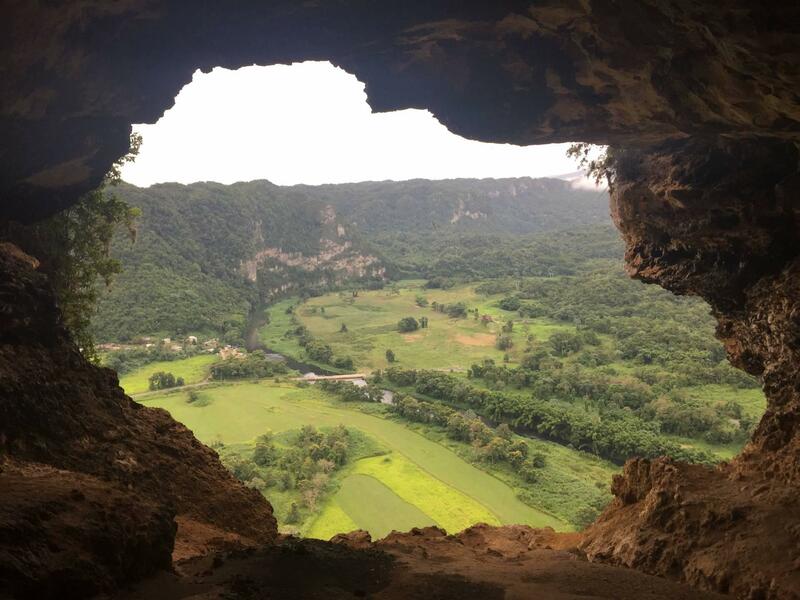 Roughly translated, “cueva ventana” means window cave, aptly named for it’s famous natural window, overlooking the Puerto Rican countryside. Cueva Ventana is found on top of a limestone cliff and is filled with stalagmites and stalactites. The stalagmites reach upwards, so that they might (“mite”) be a stalactite one day. When the two rock formations meet somewhere in the middle after thousands of year, they combine to form a column or pillar within the cave. These are highly sensitive to human touch, so you’re asked to avoid touching the growing formations. To access the cave, you’ll need to book a guided tour. You can book online, call to make a reservation or get tickets in person. Tours run approximately every 20 minutes. During the tour you’ll learn more about the Taino Indians, the indigenous people of Puerto Rico. Their drawings are still seen on the walls of the caves today. You’ll also learn about the wildlife and fauna on the island. All tours are led by locals who grew up on the island and are familiar with the countryside. 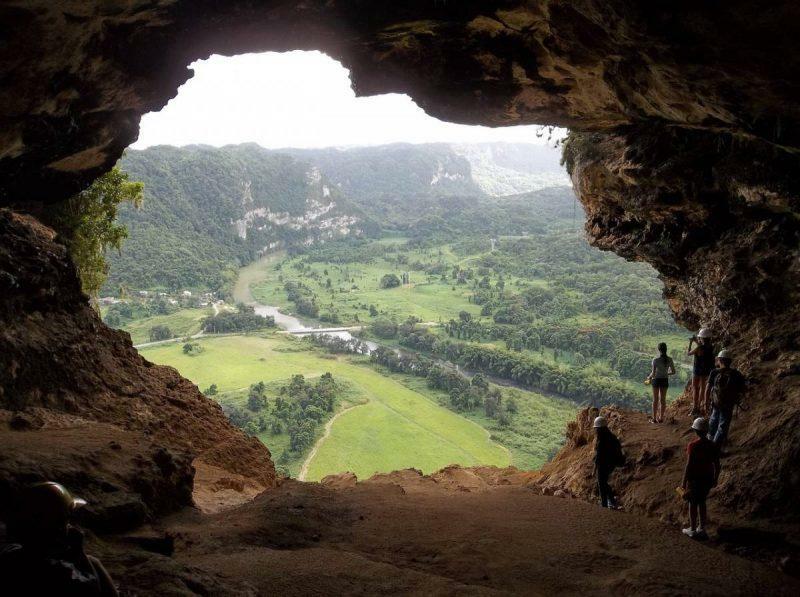 Cueva Ventana is located in Arecibo, and makes a perfect day trip from San Juan along with the Cueva del Indio and Arecibo Observatory. Take Route 22 (East or West depending on your point of origin) to Route 10 South and take exit 75B to KM75. You can park in their designated parking lot but aim to get there earlier rather than later to avoid large groups. The cave is open 7 days a week with tours on the hour ending at 5pm. You have to wear a hardhat on your tour, presumably to disclaim liability in the event you’re hit with a falling rock (or bat). Pro tip–do not look up once you’re in the caves. It will freak you out to see that many bats lurking above you. You first go through another introductory cave, where you’ll see Taino drawings and take pictures before walking onward to the separate Cueva Ventana entrance. There’s only one trail through it so the guides make sure to alternate who’s coming in and out. Once inside, you trek through dark, uncertain terrain with the possibility of bat droppings falling on you or dropping catcher–erm, helmet–at any point in time. There are a considerable amount of stairs involved and the experience requires walking for an hour pretty much nonstop, so please keep that in mind if you have difficulty ambulating. The best part about this cave, and the reason it’s become so famous, is for its fabulous photo opportunities. It’s ideal for couples kissing, solo travelers doing a yoga pose or simply standing on the edge of the window. The light cradles you and highlights your silhouette. As you’re exploring the cave, you’re given a flashlight with a red filter so that it does not disturb the bats but still allows you to walk. You can use your camera equipment at the viewpoint, including the flash, since the natural light is there anyway. You cannot use your flash inside the caves on the way to the viewpoint. There are so many natural wonders in Puerto Rico that it would be a shame to never see beyond San Juan. I recommend that you rent a car and explore some of the Isla del Encanto’s best outdoor activities on a nice day. I was so busy at the beaches that I didn’t realize there were caves in Puerto Rico! Sounds like one more reason to go back. Love your pictures! 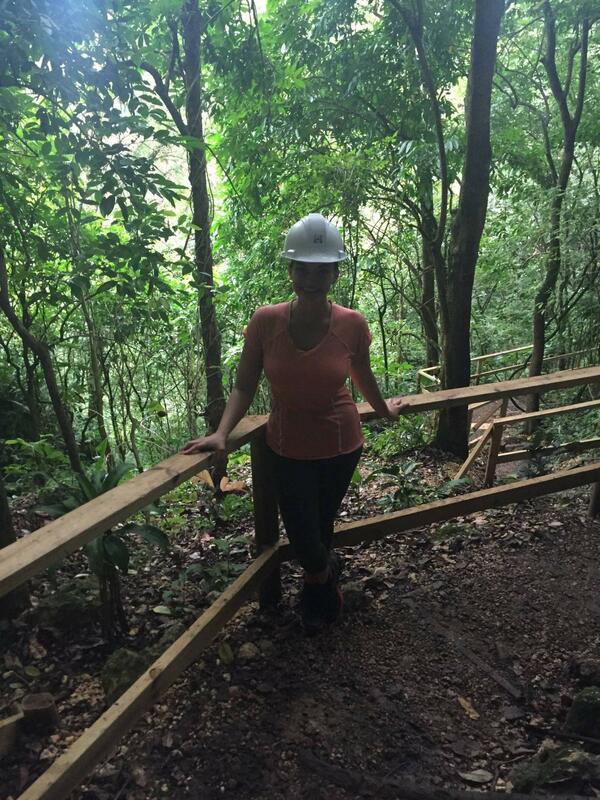 I really enjoyed my hike in the El Yunque rainforest when I was in Puerto Rico — and now it looks like I need to add caving to my list of things to do there :). This looks like serious fun. I have a notional plan to go to Puerto Rico for a week of single rope training in the caves around Aguadilla next spring. It’s probably not going to happen but it’s on the list. Also, I have a long term plan of retiring in Puerto Rico if they can keep free from federal taxes. All these dreams of Puerto Rico and I haven’t been. We’ll need to fix that soon. Until then, thank you for sharing a beautiful story and pictures. What a view! The cave really lives up to its name – Window Cave. I love it, looks like a great day trip! This is such a beautiful cave! It’s always a good idea to go there early to avoid the crowd. Hope to visit there 1 day soon. I can see why this cave is famous. It gave you such a great view over the greenery! Since you need to book a guided tour to access the cave, do you still need to pay for ticket online or at the entrance? Haha I love the stalagmites joke! We visited a cave a few weeks ago and that’s exactly what our guide said when differentiating between stalagmites and stalactites. I love the natural framing of this cave- the perfect photo opp indeed! How many of these 2000 caves have been explored? That place is just magnificent! Hello. Just wanted to share with you the best of Europes festivals over the past year. I have visited most of these in the past year and I can assure you that they are brilliant. Find time to relish in life and attend some of these this year. Looking forward to some more interesting posts on the Marina de Bolnuevo blog (www.marinedebolnuevo.co.uk). Have a great day. 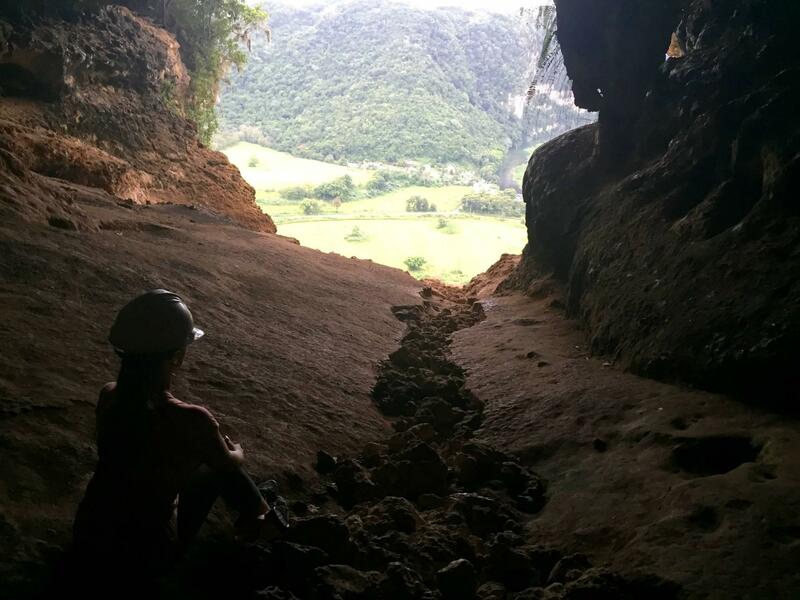 Cueva Ventana in Arecibo, Puerto Rico – Jen on a Jet Plane <Liked it!